A woman and two young children are in hospital after plunging from a fourth-floor apartment balcony in Toronto's east end. A tearful 27-year-old man appeared in a Scarborough court on Sunday. Jerome Stephenson has been charged with attempted murder and other offences, police said. 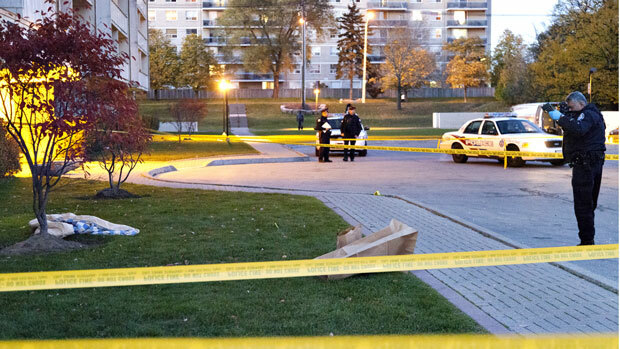 Police went to the highrise apartment building at 550 Scarborough Golf Club Rd. around 4 0 p.m. Saturday after a report of trouble. They found the girls — two years old and eight months old — conscious but in serious condition. The girls were taken to Toronto's Hospital for Sick Children, where by Sunday their condition had improved to fair. Doctors are hopeful both will survive, police said. The woman, who was taken to Sunnybrook hospital, also suffered serious injuries but they were not considered life-threatening. A large hole was left in one of the apartment’s windows.